What seats 100 people and is open from breakfast through dinner? That would be Dawson. In a suburb known for its snoozy if green streets, Dawson adds a splash of colour and a shot of flavour to the high street of Kew. Leading Dawson’s kitchen is Saint Crispin and Morris Jones alumnus Emily Wood and ex Ezard chef Majid Jreige. With both chefs learned in the art of pretty plating, there’s a fair chance you’ll want to bring your phone fully charged. 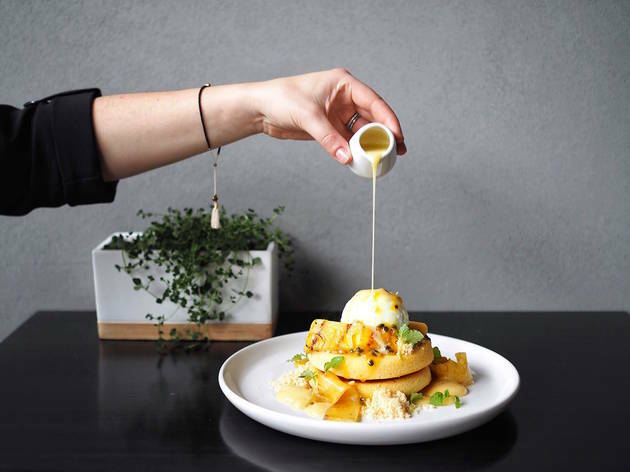 Whether you rock up at breakfast, lunch or dinner (or somewhere in between) you’ll find something to suit your fancy at this all-day eatery. 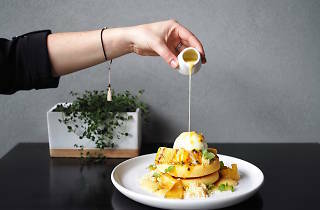 Early birds can take their pick of the classic eggs or avo on toast options, but why would you when Dawson takes brekkie off-road with matcha pannacotta and Piña Colada hotcakes? If you don’t want to drag yourself out of bed quite so early (breakfast goes until a very reasonable time of 4pm, mind you) there’s always slow roasted lamb shoulder, paella, burgers and a decent list of pizzas to keep you trekking. After something to soak up one of Dawson’s cocktails? Head straight for the mac and cheese croquettes. Dawson is open daily from 8am until late.